Because I wanted to have a volume of work in one subject I have chosen to continue work I started for C & G on the subject of trees, hence the tree bark and the ‘insect roads’ therein. I have used the technique I learnt on a course with Isabelle Weissler. The base is home dyed textured cotton covered by an unwoven synthetic fabric. 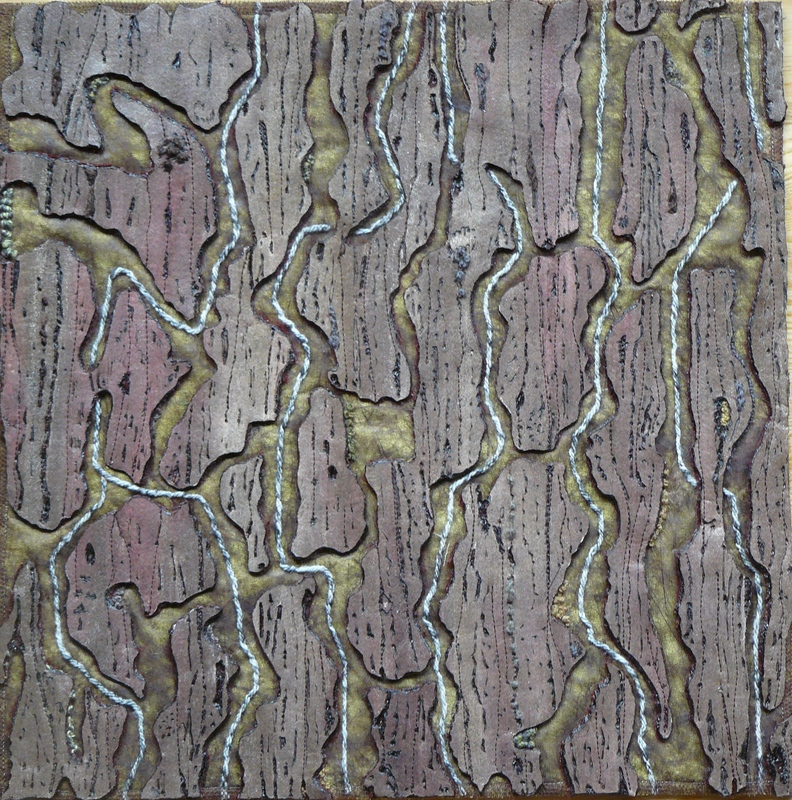 The texture of the bark is created by sticking several layers of fabric (in this case felt and velour) together with Bondaweb and then adding a layer of painted Bondaweb which is ‘sealed’ with a layer of nylon, the resulting fabric was then worked and shaped with a soldering iron. The whole piece has been machine and hand stitched to finish it. To avoid a bulky obvious edge it have bound the under ‘quilt layer’ with netting and left the bark rough at the edges. Beautiful Caro. Love your design as well as your technique. Remarkable technique for your subject, Caro! I recommend that all viewers click on the photo to enlarge it, the better to appreciate the detail of this fine work. it is hard to depict tree bark in quilts. You have come up with a winning technique. Incredible Caro, it is so real ! and it is an original interpretation.